Revisiting Art History…The greatest works of art with Cats! So on this sunny Friday afternoon, I stumbled upon a series of cat-friendly funny photoshop jobs on Laughing Squid, and felt the need to share with you here. I spent about 30-seconds renaming the great works of art below to reflect their feline update so I hope you enjoy. Also, if you too like cats, and injecting cat into your photography, be sure to check out CatPaint, one of my favorite iPhone apps, created by Davander Mobile. Buy it here in the iTunes store. 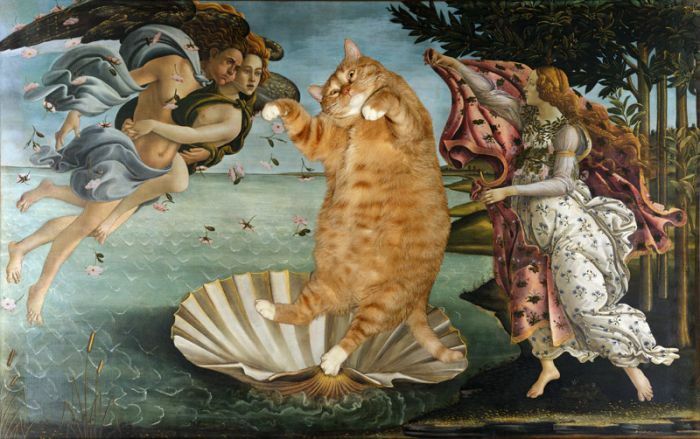 Now, revisit art history through the lens of the cat-obsessed Internet-era… Happy Friday! Salvador Dali: Just before pouncing, pomegranate Dream Caused by the Attack of the Cats! Check out the full list from a crazy Japanese website here.